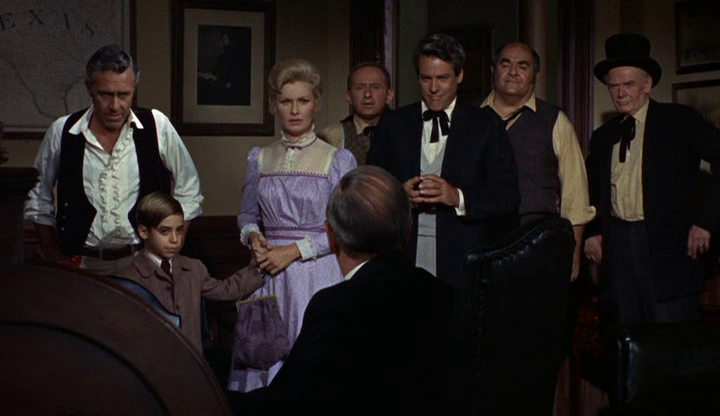 A comedy western, A Big Hand For The Little Lady is a fun and sweaty adventure that stays well within itself and plays a strong game. 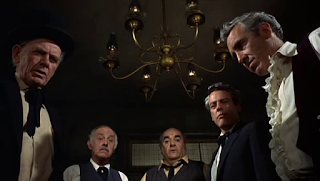 Five rich men, including the gruff Henry P.G. Drummond (Jason Robards), gather in Laredo for their annual high stakes game of poker in the back room of a local saloon. 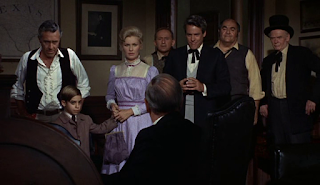 Soon after the game starts, the humble family of Meredith (Henry Fonda), his wife Mary (Joanne Woodward) and their young son Jackie wander into town. Meredith is a recovering gambling addict and perpetual loser who had promised Mary he will never play again. But the lure of the game draws him in, first to watch, then to join in. Before long Meredith is on a long losing streak, and has risked the family's $4,000 in savings. Things get a lot worse when Meredith collapses at the table while holding the strongest hand of his life. To the horror of Drummond and the other men, Mary takes over. Produced and directed by Fielder Cook, who was better known for television productions, A Big Hand For The Little Lady is a tightly focused 95 minutes of solid entertainment. With a willing cast enjoying the theatre-like setting of just a couple of key locations, the film builds up its premise, sketches in the main characters with admirable efficiency, and stokes the fire of a family's future riding on a single poker hand. Most of the action takes place around the poker table, and Fielder makes the most of a confined macho ambiance invaded first by the anxious and clearly emotionally fragile Meredith and then by the incredulous Mary. Meredith has the stamp of a loser on his moist forehead, Mary then has to display grim yet clueless determination to rescue their modest fortune. Drummond leads the brusque howls of objection as a man who interrupted his daughter's wedding to attend a game now seemingly descending into farce. Meanwhile Habershaw (Kevin McCarthy), another of the rich men around the table, finds Mary attractive and is the only one of the players to extend her some sympathy. Fonda excels in a relatively small role, exaggerating his worried eyes and luxuriating in gallons of sweat as the losses mount. Woodward is the perfect prim and proper wife, exasperated by her husband's addiction then holding her cards very close to her chest. Secondary characters become prominent as the film progresses, with the town doctor (Burgess Meredeith) then the local banker C.P. Ballinger (Paul Ford), a tycoon who despises poker, finding themselves sucked into the drama. With plenty of humour and some added spice, A Big Hand For The Little Lady works its way to a moment of realization and growth for the rich men of Laredo. Drummond in particular gains new perspective on what matters in life as he returns to his daughter's wedding, even if the true identity of the sucker at the table remains a mystery.